Microsoft announced today that it plans to release two feature updates for Windows 10, Office 365 ProPlus and System Center Configuration Manage per year. The company will align release schedules for future Windows and Office 365 ProPlus releases, and targets March and September of each year for those releases. 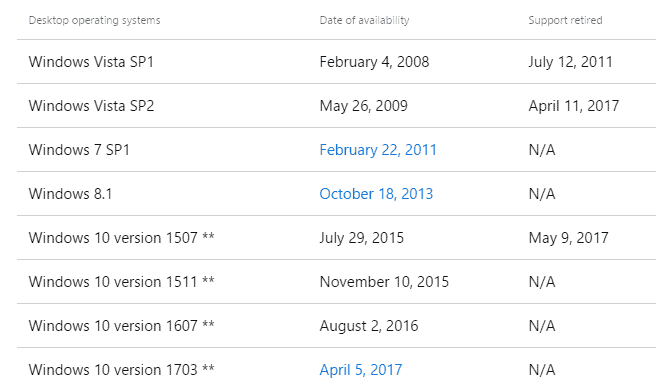 What's particularly interesting about that from a Windows 10 users perspective is that Microsoft targets September 2017 for the next Windows 10 feature update, codename Redstone 3. Target does not necessarily mean that the next feature update will be released in September. Microsoft targeted March 2017 for the Creators Update for instance, but did release it in April 2017. It is possible that the Redstone 3 update will be finalized in September but released in October 2017. Microsoft has yet to reveal the focus of the upcoming feature update for Windows 10. The three previous feature updates, November Update, Anniversary Update and Creators Update, added much needed functionality to the operating system such as support for extensions in Microsoft Edge, Bash shell, Windows Ink, and a lot more. Another interesting tidbit that was revealed today on the Windows for Business blog was that Microsoft plans to service and support each Windows 10 feature release for 18 months. This falls in line with the company's current stance on supporting the different Windows 10 versions. The first feature update version of Windows 10, in this case the first release version of Windows 10, version 1507, will be retired on May 9, 2017. Microsoft's stance remains that it will support the two last Current Branch for Business releases. These are currently Windows 10 Version 1511 (November Update), and Windows 10 Version 1607 (Anniversary Update). The Creators Update will become the next Current Branch for Business version about four months after its general availability. A grace period starts for the oldest feature update that is still supported then. Next up in line is the November Update which Microsoft will end support for in October 2017. Two feature updates per year put a lot of strain on IT departments. One option that is available is to skip every other release to buy more time for testing and deployment. Enterprise customers may select the Long Term Servicing Branch version of Windows 10 instead, as it is supported for a longer period of time, but most smaller businesses and even home users may not want to pay the premium for that edition, if it is available to them at all, that is. Now You: What's your opinion on the pace of feature update releases for Windows 10? So two OS reinstallations per year. And they require you to do that just so they can update crap like Edge. Windows 7 can update IE8 to IE 9, 10 or 11 and Windows 10 can’t update Edge separately? Not to mention that even in Windows 10, IE is the browser tied more to the OS, not Edge, which level of integration is the same as every other third party browser. Absolutely farcical. Agreed, a direct update has never been the most reliable method. So, two full re-installs per year… not a great idea. Sadly for Microsoft, things were better before. W10 is a good OS and I use it but after W7, something was lost and I’m not sure it can ever be repaired. That means you’ll have only two big clusterfu*ks to deal with instead of 12 smaller ones. Who wants to re-install twice a year …………? Upgrading would be the most easy way, though its not the best…….. I think its a good idea to skip an upgrade each time , so you get one upgrade each year . If you are obliged to stick with W10, the best way is to use RTM LTSB, it’s security updated until 2025. How does regular Joe User get LTSB? Windows 10 LTSB while better than regular version, is still ridden with spyware, it doesn’t stop talking even if you disable telemetry from regedit and gpedit. Peerblock still shows Windows 10 connecting to various servers every few minutes or so. Not sure how they still get away with that considering Enterprise firewalls and all. It appears most people on this site post solely to roast Microsoft and/or Windows 10, which is a shame really. :/ Eyesore, kys or be positive. Or go to Lunix you damn lunatics! Actually, I prefer to USE my PC rather than faf about constantly reinstalling Windows all the time. I spend my entire day job fixing PCs without wanting to do it all the time at home as well. As for roasting, Windows 10 could be good and well accepted if only MS could make a few simple changes. Namely, provide proper control over updates, an “off” switch for telemetry that actually works, test it properly before releasing updates, and try completing the core of the OS before faffing on with extras like “3D Paint”. It’s nearly 2 years since it was released, and still half the settings are in “Control panel”, and half are in “Settings”. This means it always feels messy, inconsistent and unfinished. Linux Mint as host OS and Windows 10 as a guest OS on VMWare Workstation Player seems best option. Yes, especially with Directed I/O for gaming. For me that’s the only reason to use W10 atp. and only update to a new version when eol is announced for my current version. It may also be that Martin will always post when a version approaches eol – I just bookmarked that page in case he doesn’t. I will likely then just do a reset and then update to current version, it isn’t too much more hassle and should clean out some accumulated junk. Does anyone else feel like we’re living in a bit of a nightmare with Microsoft and the direction Windows 10 has gone down, with the all out assault on personal privacy, voluminous secretive uncontrollable telemetry, unwanted ads at the operating system level, and interference with settings and preferences. I consider it all a disgusting violation. That this corporation is so disconnected from reality have developed a perverted sense of entitlement over people’s personal private computing usage. I can’t believe the laid-back acceptance of this behavior from the power user bloggers and tech journalists, why aren’t there more, louder voices calling for governments to act and curtail Microsoft, surely Microsoft are testing their limits, and finding they’re getting away with it. We have to stand up and fight back or our individual liberties will be lost.